Goats might be widely known for jumping exuberantly, fainting spontaneously, and yelling like humans on occasion, but there are many more reasons to enjoy these adorable ungulates. For example, they are naturally curious, they’re light on the earth, and they bring us many delicious and nutritious foods. 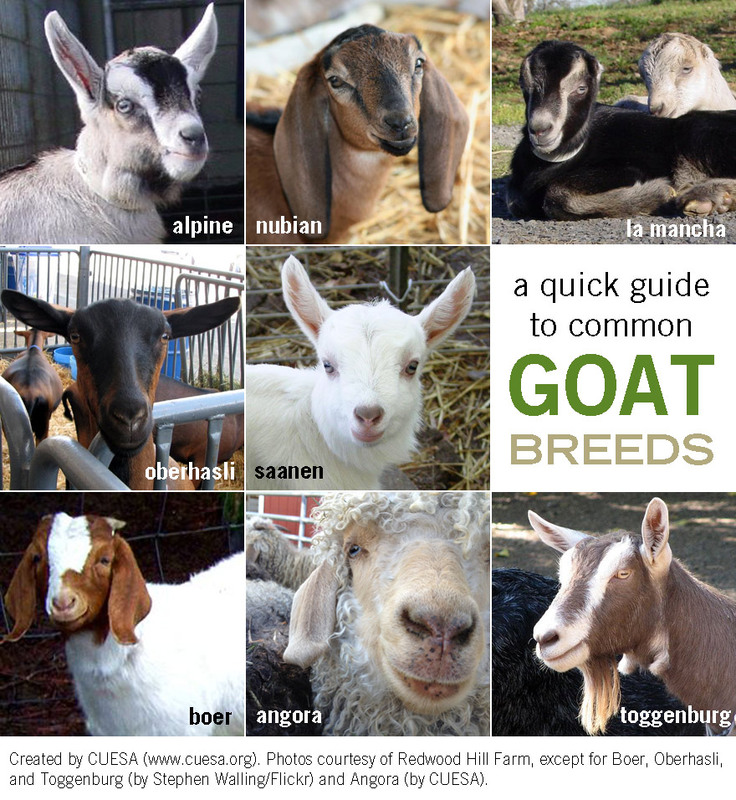 To prep you for the festivities tomorrow, here are 10 fun and endearing facts about goats, compiled by Redwood Hill Farm and CUESA. Goats are one of earliest animals to be domesticated by humans. Archaeological records suggest that farmers in the Middle East began raising goats 10,000 to 11,000 years ago. Today, Africa and Asia lead the world in goat production. Goats are generally raised for dairy, meat, and fiber. Popular dairy breeds include Alpine, La Mancha, Oberhasli, Nubian, Saanen, Sable, and Toggenburg. Boer is the most common meat breed. Angora goats are raised for mohair, a silk-like fiber used in yarn. Many goats produce a downy winter undercoat known as cashmere, though only certain breeds produce enough to be raised for commercial fiber production. Female goats have two teats, in contrast to cows, which have four. Nannies typically give birth to twins, with single kids, triplets, and larger litters being less common. The mothers produce an average of one gallon of milk a day, the highest yield of milk for their body size among dairy animals. The fat content of goat’s milk is similar to cow’s milk, but goat’s milk has smaller fat globules, which means the cream doesn’t separate and rise to the top, and therefore the milk doesn’t need to be homogenized. The distinctly “goaty” flavor of the milk and cheese is due to the presence of fatty acids like caproic, caprylic, and capric acid, which take their names after goats (Latin caper). Some people who have sensitivities to cow’s milk are able to enjoy goat dairy. It has roughly the same amount of lactose as cow’s milk but contains only trace amounts of the allergenic casein protein alpha S1 and it has smaller butterfat particles, making it easier to digest. Goat’s milk can be consumed straight or made into cheese, ice cream, yogurt, kefir, confections, soaps, and other products. The “other red meat,” goat is a lean and heart-healthy source of protein, with lower fat, fewer calories, and less cholesterol than both beef and chicken. Under USDA guidelines, growth hormones are not approved for use in goats. Antibiotics are used rarely, and only as needed to prevent or treat diseases. Goats are eco-friendly brush-clearing machines. Like cattle, sheep, and other ruminants, the goat has a four-compartment stomach; however, goats are browsers, not grazers, meaning they prefer shrubs and other woody plants to grass. 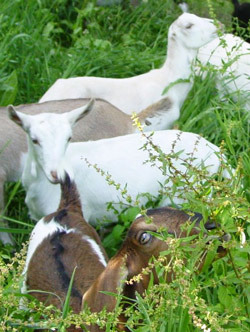 They will gobble up difficult invasives like poison oak and blackberry brambles, making goats a nimble and sustainable alternative to herbicides and gas-powered mowers. They are especially adept at clearing hard-to-reach places like hillsides and ditches. Through City Grazing in San Francisco, goats are used for landscaping and fire prevention. 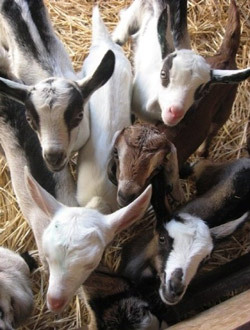 It takes 10 goats to produce the milk of one cow, but 10 goats are better for the environment, since they eat less food and emit less methane gas than cows. Because of their small size, they are suited to both commercial and household settings, and their dry, pelletized droppings provide a clean, odorless, and nutrient-rich natural fertilizer. Get your goat! Backyard goats are legal in San Francisco. According to the San Francisco Health Code, two female goats may be kept for “exclusive use of the owner’s family.” You can get the lowdown on urban goat-keeping from Itty Bitty Farm in the City. Pet baby goats, sample goat products, meet local producers, and CUESA’s annual Goat Festival every April. In the meantime, see what the goats of Redwood Hill Farm are yelling about.